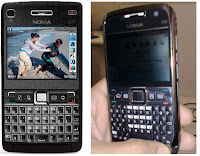 Nokia is apparently going to come up with its successor to the popular E61/E62/E61i soon. Found some articles and some real photographs of prototypes. The E71 will be slightly smaller than the E61 (and hence should be more pocketable) and would have GPS (finally!) and a 3.2 MP camera (how good would be the image processor?). It would definitely be tempting to upgrade my E61 when it is released.